Gerbera daisies are prized for their large, many-petaled and brightly colored blooms. Striking pinks, reds and yellows are just a few of the colors this flower boasts. Heavily hybridized, Gerbera daisies are available in nearly any color imaginable, adding a colorful touch to any room where they are displayed. Gerbera daisies are hardy plants that grow well indoors in pots and require minimal care to thrive. In warm weather, move the potted daisies outdoors onto decks and patios to add an eye-catching natural touch to your outdoor decor. 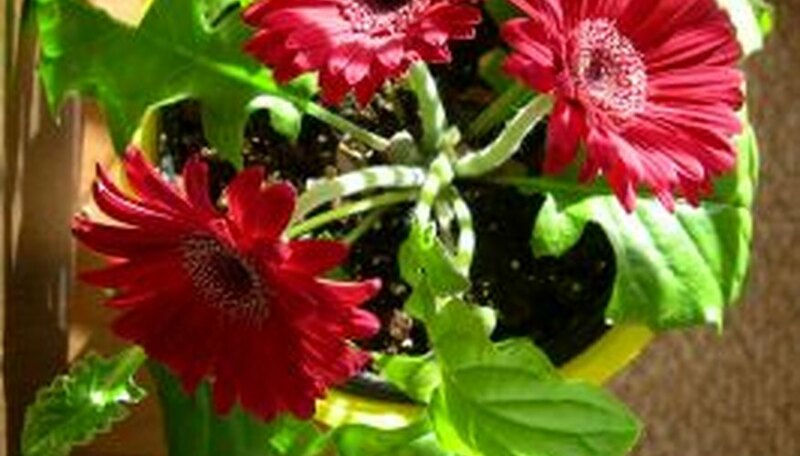 A potted Gerbera daisy should be replaced every three years. Choose or transplant Gerbera plants into 6-inch or 1-gallon containers. Transplant the daisies in the spring, and place only one flower in each pot. Place the pot where it receives indirect sun, such as in a south-facing window. Outdoors, make sure pots are not placed under shaded porch overhangs and can receive some sunlight. Fill a shallow bowl with water and set the base of the pot into it. Allow the soil to pull up water for one to two hours, then remove the pot from the bowl. Allow the soil to dry out between waterings. Remove spent flowers and dead leaves immediately. Snip off flowers with garden shears below the flower bud where the petals emerge from. Cut off dead leaves at the base. Use pots with plenty of drainage or check that purchased daisies in pots are well-draining for best growth and minimal disease. Cut daisies survive in arrangements for up to 14 days. Apply a fungicide immediately if a powdery coating is detected on leaves and leaves and flowers begin to wilt and die. Avoid getting water on the blooms or leaves. This may lead to fungal infections.